Cicely Mary Barker - (June 28, 1895 - February 16, 1973) Cicely Mary Barker was born in 1895 in Croydon, a town near London, England. She suffered from epilepsy as a child and remained physically delicate for most of her life. Cicely Mary Barker was unable to go to school, so she was educated at home and spent much of her time on her own, reading and drawing. 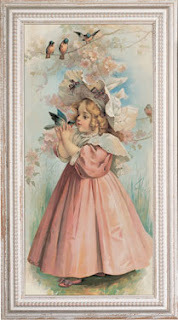 In 1908, when Cicely Mary Barker was 13, her father enrolled her at Croydon Art Society, where they both exhibited work. She also enrolled in a Correspondence Art course which she continued until 1918. At 16, Cicely Mary Barker was elected a life member of Croydon Art Society, the youngest person ever to receive this honour. The art critic for the Croydon advertiser commented: "Her drawings show a remarkable freedom of spirit. Cicely Mary Barker has distinct promise." In 1911, when she was 15 her father submitted some of her work to Raphael Tuck, the stationery printer, who bought four of her pictures for greeting cards. From this time onwards, Cicely Mary Barker was able to sell her work to magazines, to postcard and greeting card manufacturers, and later to book publishers. This was very helpful to the family finances for her father died when Cicely Mary Barker was 17, leaving Cicely, her elder sister and her mother in difficult circumstances. Cicely Mary Barker was industrious and determined. She sent her flower fairy paintings to several publishers before Blackie accepted them for publication in 1923. She was paid only £25 for a total of twenty-four illustrations and verses in Flower Fairies of the Spring, the first of the Flower Fairy series. Seven more little books about Fairies were to follow. Cicely Mary Barker was also influenced by the huge popular interest in fairies which developed from the Victorian enthusiasm for fairy stories and was epitomised by the immense popularity of J M Barrie's Peter Pan in the early part of the 20th century. Published in 1923, Flower Fairies of the Spring was well received by a post-industrial, war-weary public who were charmed by Cicely Mary Barker's vision of hope and innocence, which seemed to evoke a less aggressively modern world. A Joy Ride, Elves and Fairies, 1918 Queen Mary did much to encourage the vogue for fairy paintings during the 1920s by frequently sending postcards depicting fairies to her friends. This popularity saw the publication of Cicely Mary Barker's Elves and Fairies postcards in 1918. Cicely Mary Barker always used real-life models for her paintings. Most of the models came from the kindergarten her sister Dorothy ran in the back room of the house in which they lived. She also painted the children and relatives. One of her models was Gladys Tidy, the young girl who came to the house every Saturday to do the household work. Cicely Mary Barker always asked the child model to hold the flower, twig or blossom of a particular fairy, for she wanted to be sure of the accuracy of her depiction of the shape, texture and form of the plant. Her only alteration was to the size, she enlarged the flower to make it the same size as the child. Cicely Mary Barker's flowers are always botanically accurate. If she could not find a flower close at hand, she enlisted the help of staff at Kew Gardens, who would often visit with specimens for her to paint. Cicely Mary Barker's Fairies are not ethereal fairies of the supernatural, but portraits of real children, whose characters match the characters of the flowers. 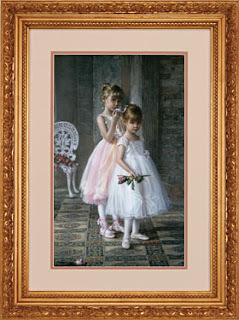 If you would like to see more images by Cicely Mary Barker or purchase them, you may visit www.gallerygraphics.com or call us at 1-800-367-4370. Doug Knutson - Native Iowan, Doug Knutson, brings to life his Midwest surroundings in his landscapes, still life and wildlife paintings. Even as a youngster growing up in Council Bluffs, Iowa, Doug Knutson knew he would devote his life to his artwork. Following graduation from Omaha Art School, he began his career as an illustrator in the Editorial Art Department of an Omaha newspaper. After about 12 years at that position, Doug Knutson’s commercial art career took him to an Eastern Iowan illustration studio where he spent several years working for national clients. Over the years he has completed illustrations for such places as Burger King, Wal-Mart, Random House, McDonalds, John Deere, The Franklin Mint and Target. Illustrations have ranged from CD and video cases to children's books covers, posters, beer labels, advertising materials and collectibles tins and plates. Upon becoming a freelance illustrator several years ago, the flexibility of time led Doug Knutson back to his love of nostalgia, antiques and rural life, and today there are over 65 acrylic paintings in print, inspired by his Midwestern surroundings. Currently, Doug Knutson resides in Cedar Rapids, Iowa, balancing his time between illustration assignments and images for prints. If you would like to see more images by Doug Knutson or purchase them, you may visit www.gallerygraphics.com or call us at 1-800-367-4370. Laurie Snow Hein - Although Laurie Snow Hein has always drawn, when her kindergarten teacher asked if she was going to be an artist, she replied that "no", she planned to be a doctor. Her talent was inescapable, though, as both parents, a grandmother and brother were also artistic. A mother of six and an avid animal lover, Laurie Snow Hein's favorite subjects are children and animals. She says her love for nature and the challenge of portraying the beauty of God's creations keep her painting. At home in Palm Beach Gardens, Florida, Laurie Snow Hein carries her love for animals into the ring, raising show horses, goats and chickens. She began her venture into art by coloring sepia-tone photographs for her dad's studio at the age of eight. Laurie Snow Hein studied with a well-known illustrator through high school and received a full scholarship to Columbus College of Art and Design. Laurie Snow Hein refers to her style as "Old-World Realism," but her technique often gives way to abstract or impressionistic forms. 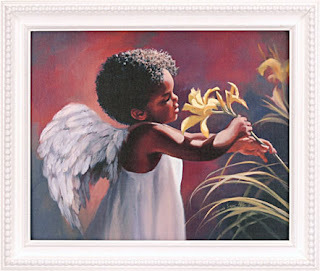 Laurie Snow Hein’s love of children and animals reveals itself in her sensitive, creative works. Laurie Snow Hein’s designs have graced many products in the home décor and giftware markets for the past decade, which has made her a household name. Consumers can’t seem to get enough of her licensed products. If you would like to see more images by Laurie Snow Hein or purchase them, you may visit www.gallerygraphics.com or call us at 1-800-367-4370. Todd Williams - Todd Williams, a Carthage, Missouri native, became involved in art at an early age. In grammar school his watercolor of the Missouri State Capitol was chosen to be shown on national television. 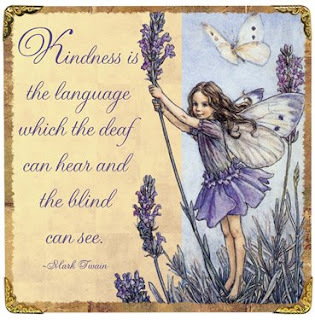 Encouraged to continue his artistic talent throughout his school education, Todd Williams earned a Bachelor of Arts Degree from Missouri Southern State University in 1986. He began his career in the field of graphic arts after earning his degree. Todd Williams has worked as a print and art director, graphic designer and photographer for several large product manufacturing companies. Although he has spent many years building his career in graphics, Todd Williams has never lost sight of his true passion: creating fine art. He always finds time to paint, sketch, or photograph the world around him. Todd Williams’s medium of choice is pastel, and his favorite design element is color. He uses rich, vibrant color to bring life and inspiration to his landscapes, still life's, and portraits. As Todd explains, “If I can capture through my artwork a mood, a feeling that compels the viewer to reminisce about a place they’ve been, or just reaches out to them, to me, that’s a success. That’s what I want to achieve.” Todd Williams enjoys participating in art shows and has received many awards in competitions. His work is currently on display in the Eureka Fine Art Gallery in Eureka Springs, Arkansas, Cherry’s Art Gallery in Carthage, Missouri and in private collections across the country. Todd Williams currently resides in Neosho, Missouri with his wife Tamie, a son Alex and a daughter Kaitlyn. If you would like to see more images by Todd William or purchase them, you may visit www.gallerygraphics.com or call us at 1-800-367-4370. Barbara Mock - American Impressionist Barbara Mock, is well known for her florals and still lives, peaceful scenes, charming cottages, ivy-framed birdhouses, whimsical gardening angels, delicate tea pots and tea cups and colorful dried flower wreaths. Her unique style of oil painting is structured with a strong sense of design and embellished with brush strokes varying from thin to bold. Barbara Mock creates delicate lace patterns and strong substantive blends of subdued color in subtle contrast with an inner strength and romantic flavor so perfect for traditional decor. Barbara Mock’s art career started in grade school where she was active in all art activities in her home town of Guthrie, Oklahoma until she finished high school. Barbara Mock then married Jim Mock and they had two children, Jeffrey and Cheryl. During the next 20 years, the Mock family lived in Dallas, Texas, Coral Springs, Florida and finally settled in Atlanta Georgia. During her staying each city, Barbara Mock continued to work at her art by exhibiting at local shows, teaching and studying with such noted artists as Richard Geotz, JoAnn McCrary, Raymon Froman, Bud Biggs and Naomi Brotherton.“My art has a big influence over me,” Barbara laughs. “I look at the world a little differently than most people. I have to study each new blossom and leaf. I really do take the time to smell the flowers. Each new painting is a challenge and a growing experience. I am so happy to be able to share my art with so many people.” Barbara Mock’s originals are in collections throughout the country and have been in many shows and have won many awards. Barbara Mock and Jim currently reside in a new home in the picturesque north Georgia mountains. They are the proud grandparents of a grandson,Ross Wilson and granddaughter Rachael. Barbara Mock is licensed and published exclusively by Bentley Publishing Group of Walnut Creek, California and distributed worldwide. 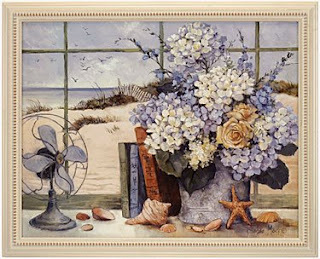 If you would like to see more images by Barbara Mock or purchase them, you may visit www.gallerygraphics.com or call us at 1-800-367-4370. Tom Browning -Born in 1949, Tom Browning has been a professional artist since 1972. Although his true passion for art is best seen in his fine art genre paintings, he is perhaps best known for his wonderful images of Santa Claus. After attending the University of Oregon as an art major, Tom Browning almost immediately began selling and submitting paintings to the galleries. As his interests in subject matter and medium continued to evolve, collectors continued encouragement by eagerly accepting his changing themes and directions. Now there are few subjects Tom Browning hasn't painted, but figures, still life and landscapes remain his favorites. It's ironic that a commercial venture launched by Tom Browning and his wife, Joyce, fifteen years ago created an entirely new market for Santa Claus and put Tom Browning at the top when it comes to depicting the beloved icon both at work and play. Tom Browning's treatment of these paintings as fine art was a key factor in their success and popularity. In 1994 his instructional book "Timeless Techniques for Better Oil Paintings" revealed yet another aspect of Tom Browning's talents — teaching. Since then, he has conducted oil painting workshops all across the country, and has helped and encouraged hundreds of eager to learn painters of all ages. Even though people have been the subjects of Tom Browning's paintings, a recent interest in portraiture has found him focusing on treating the crafts as yet another form of fine art. The likes of Sargent, Sorolla and Zorn have inspired him to look at a portrait as a challenge to create a subject of interest to any observer and lover of art. 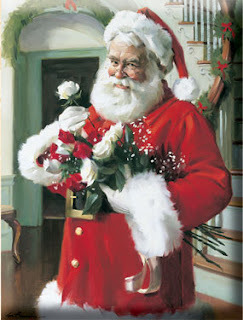 Tom Browning has painted over 123 delightful scenes of Santa since 1984 when Arbor Green Publishers began printing greeting cards and prints. These designs are also licensed to manufacturers that feature them on many other products such as greeting cards, figurines and gift bags. If you would like to see more images by Tom Browning or purchase them, you may visit www.gallerygraphics.com or call us at 1-800-367-4370. Sandra Kuck - Admirers of Sandra Kuck know that this talented artist puts a little of herself into every painting. Her strong sense of family and appreciation for beauty is echoed in all of her works, from which she has captured a loyal and appreciative audience. Sandra Kuck describes herself as a “romantic realist.” Her nostalgic settings and angelic children evoke memories and emotions of childhood. With vibrant color, delicate lighting, and exquisite lace and flowers, Sandra Kuck creates a romantic and peaceful atmosphere, capturing the beauty and simplicity of days gone by. 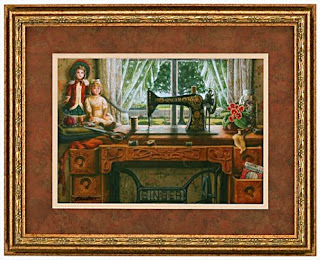 Sandra Kuck finds her inspiration from many different sources, including the special relationship between mother and child, the beauty of country garden, or the fine furnishings and the clothing of the Victorian era. Her pursuit of perfection, exacting standards, and her attention to detail allows her to paint only eight to ten pieces per year. It is the ability to create flawless scenes of serenity, joy, and elegance that has made her one of the most beloved artists in North America.As a child in Ohio and Southern California, Sandra Kuck always loved to doodle and sketch. It was during her education at UCLA and The Art Student’s League in New York where she realized her love for painting children and deviated from her professor’s emphasis on modern art. Later, it was her husband John, who encouraged Sandra Kuck to pursue her dream of becoming a professional artist. Though they quickly started a family, John cared for the couple’s young children on weekends, so that Sandra Kuck could have an opportunity to develop her artistic talents. Once the children started school, Sandra Kuck was able to devote more time to her art, while John sold her works to local galleries. Their confidence in her special talents would eventually find embodiment in the collection we see today.Thanks to a steadily growing fan base, it was in 1983 that Sandra Kuck’s work received national recognition. That year she was honored with the National Association of Limited Edition Dealers’ (NALED) Plate of the Year, Print of the Year and Artists of the year awards. Since 1983, she has been honored several times with honors from NALED, including an unprecedented seven-time honored as Artist of the Year. Although she enjoys acclaim, she treasures her time at him in her studio. A modest person, she is still easily embarrassed by praise from her faithful collectors. Sandra Kuck has responded to the overwhelming demand of her fans by extending her range of products by focusing on extending her brands into different product categories. Sandra Kuck is pleased that in 2007, strategic license agreements were reached with eight different companies from various markets including puzzles, greeting cards, and collectible boxes. With such a busy schedule, Sandra Kuck enjoys time relaxing with her family and walking in the peaceful tranquility surrounding her Florida home. If you would like to see more images by Sandra Kuck or purchase them, you may visit www.gallerygraphics.com or call us at 1-800-367-4370. Angela Anderson - Folk art with a distinctive cute, cheery and happy style is Angela Anderson's forte. Her hand-painted and hand-stenciled wooden decorative pieces warm the homes where they are displayed. Designs featuring seasonal icons brighten up the holidays. And now Angela Anderson is taking her unique folk art style to canvas. Inspired by her surroundings - gardens, homes, magazines, kids faces, Angela Anderson captures the latest trends in folk art. 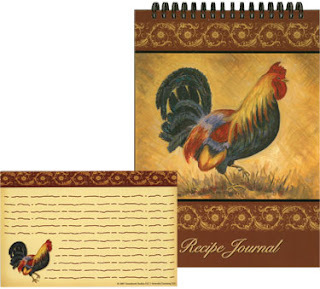 Hand-lettered brief messages or wishes on some designs add a personal touch. While she liked to draw as a youngster and acquired two years of commercial art schooling, Angela Anderson's creative career really took off when a friend asked her to design some wooden decorative pieces for a baby's nursery. That was nearly 20 years ago and the beginning of Country Folk Wurk. Today, she looks forward to continually expanding her creative horizons. If you would like to see more images by Angela Anderson or purchase them, you may visit www.gallerygraphics.com or call us at 1-800-367-4370. Catherine Klein – (1861-1929) Catherine Klein, while a well known artist, not much is known about her personal life. After attending art school in Berlin, Catherine Klein became widely sought after as a postcard illustrator. Catherine Klein's artwork is still much in demand today & several schools still use her work as “gouche” (opaque watercolor) examples. If you would like to see more images by Catherine Klein or purchase them, you may visit www.gallerygraphics.com or call us at 1-800-367-4370. Louis Icart – (1880-1950) Louis Icart was born in Toulouse, France. Louis Icart began drawing at an early age. Louis Icart began working in major design studios. While fighting in World War I, Icart would draw on anything he could find. When Louis Icart returned from the front, he would turn these drawings into prints. 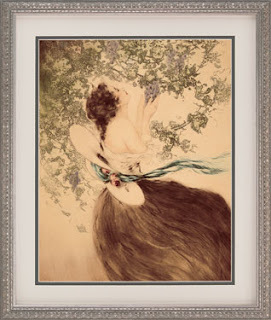 If you would like to see more images by Louis Icart or purchase them, you may visit www.gallerygraphics.com or call us at 1-800-367-4370. Maud Humphrey – (1865-1940) Maud Humphrey, mother of actor Humphrey Bogart, was best known for her whimsical portraits of children at play. Maud Humphrey did illustrations for Ivory Soap, Harper’s Weekly, & The Century to name a few. Humphrey Bogart’s curly locks & adorable face made him a suitable model for several of Maud Humphrey's illustrations. If you would like to see more images by Maud Humphrey or purchase them, you may visit www.gallerygraphics.com or call us at 1-800-367-4370. 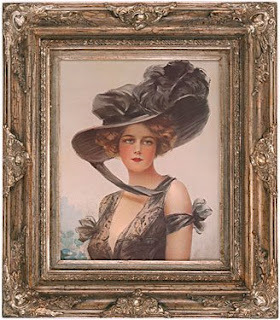 Harrison Fisher – (1875-1934) Harrison Fisher was born in Brooklyn, NY, spent his youth in San Francisco & returned to New York. 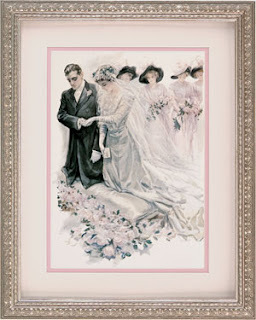 Known for his magazine & newspaper paintings, Harrison Fisher was nicknamed by some as “The Father of a Thousand Girls”. After Harrison Fisher death, a relative kept a few paintings and burned over 900 of his remaining artworks, at his request. If you would like to see more images by Harrison Fisher or purchase them, you may visit www.gallerygraphics.com or call us at 1-800-367-4370. Philip Boileau – (1863-1917) Philip Boileau was born in Quebec, Canada. Philip Boileau was well known for his talent of painting highly respected & noble women. Philip Boileau most famous piece was “Peggy Head” a portrait of his wife, who appeared repeatedly in Philip Boileau's portraits. If you would like to see more images by Philip Boileau or purchase them, you may visit www.gallerygraphics.com or call us at 1-800-367-4370. Fred Morgan – (1856-1927) The painter Fred Morgan was born in London, lived in Aylesbury, Leighton Buzzard, 3 years at Ventnor on the Isle of Wight, and ended back in London. 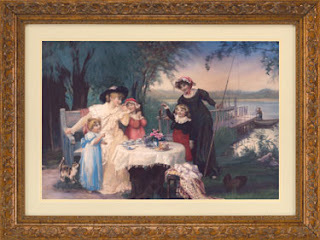 Fred Morgan specialized in pictures of children, rustic peasants, baby animals, and sailors. If you would like to see more images by Fred Morgan or purchase them, you may visit www.gallerygraphics.com or call us at 1-800-367-4370. 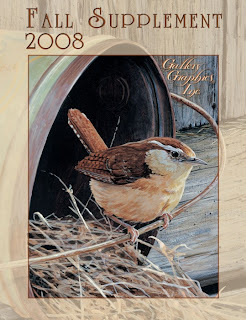 We are happy to announce the release of the NEW 2008 Fall catalog. 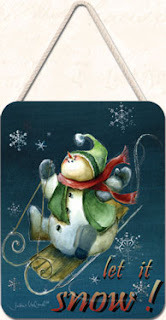 New Plaques - Halloween, winter & fall scenes. 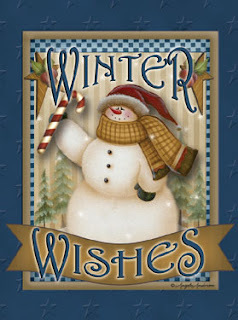 Christmas & winter sachets - 2 new styles: Winter Spice by Angela Anderson, Here Comes Santa by Tom Browning & 3 of our tried & trues: Vintage Traditions, Christmas Memories, & Harvest Blessings by Vicky Howard. New Arbor Rose sachet collection. Top 8 Paul de Longpre roses designed with a scrolling arbor. New Silhouettes - These reproductions of Victorian silhouettes were originally produced with really dried flowers & materials behind the hand cut silhouette. 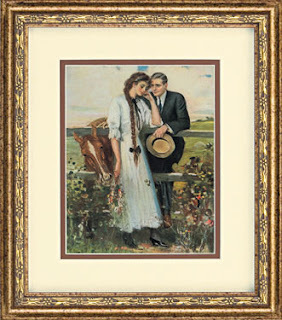 New Framed prints by Sandra Kuck, Fred Morgan, Arthur J. Elsley, Philip Boileau, Laurie Snow Hein, Charlene Olsen, Pino, Dona Gelsinger, Igor Levashov, Paul de Longpre & Harry Roseland. If you would like to opt for the greener version, you may download the catalog directly to you computer. After logging on you will see a link to go to the PDF site. This is time & environmentally friendly. Hope your fall season is the best ever!! Place an order of $300 or more in May, and we’ll pay ½ your shipping….Order $500 or more, and your shipping is FREE! Please contact our office at 1-800-367-4370 to place your order today! Shipping offers apply to ASAP ship orders only…no later ship dates please. Free shipping offer not available in conjunction with any other discount, promotion, or show special. This offer is for companies within the Continental U.S. only. 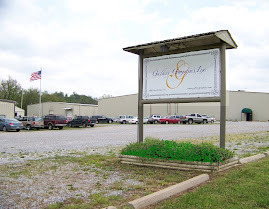 Thank you to all of the customers, rep & vendors calling & checking on us here in Noel, MO. Luckily, we have no tragedies to report. All of our employees, friends & families are safe. We are located about 30 to 45 minutes from the closest damage. There are very scary stories of people visiting family, leaving to go home & within minutes of leaving being pelleted with hail, rain & wind. After this passes returning to the house they just left, to find softball size hail had broken windows & a roof being torn off a garage. We have other tales of people driving down the road, not being able to see, wind pushing debris everywhere & then it is gone. Newton county (where the northern tornado was), Benton county (strong straight line winds & smaller tornadoes) & Picher, OK (the complete town was devastated) are all within the 45 mintues of Gallery Graphics. We are very lucky to be located where we are. Thank you again for your concerns. We are all safe & wish others in the community to a quick recovery.